Every Wednesday, Gretchen Reynolds singlehandedly influences how millions of Americans work out. In her Phys Ed column for The New York Times, she debunks myths, spurs conversation, and creates arguments among her readers by questioning widely held beliefs about exercise. Expanding upon her popular columns, Reynolds tackles the questions we all have and (sometimes) ask about exercise. Consulting experts in physiology, biology, psychology, neurology, and sports, she uncovers how often we should exercise, how long workouts should be, how to avoid injury, and how to find the right form, routine and equipment for our goals. 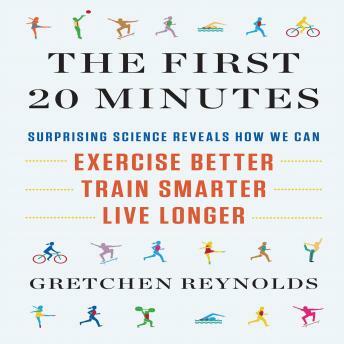 Drawing on scientific expertise as well as her own athletic experiences, Gretchen Reynolds will help you find the right workout for your body, age, fitness and goals. Whether your desire is to be fit for the rest of your life, to look great in a smaller dress size or to run your third marathon in Boston, The First 20 Minutes will make your workouts work for you.